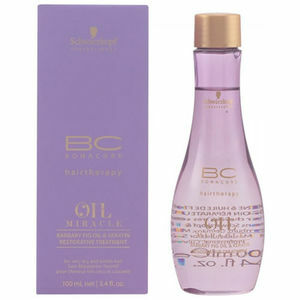 Softness and flexibility for very dry hair. Schwarzkopf Professional BC Oil Miracle Barbary Fig Oil & Keratin Restorative Treatment offers serious replenishment to very dry and brittle hair. It restores strength and delivers smoothness and opulent shine without overburdening. Flexibility is restored to the hair fibre to provide optimum control and manoeuvrability and to avoid frizz. Simply apply a few drops on wet hair before blow-drying or as finishing product.